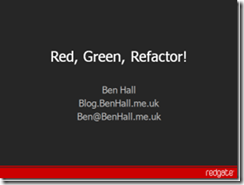 DDDIreland Teaser – Red, Green, Refactor! For DDDIreland, all of the speakers where asked to do a teaser about their session. This is the session I will be running at DeveloperDayScotland and NxtGenUG Coventry. The teaser is just a short 4 min demo of writing your first test and what else to expect from my session. If you have any questions about the session, then please contact me. Just to let everyone know, I will be speaking at DDD Scotland (May 10th). 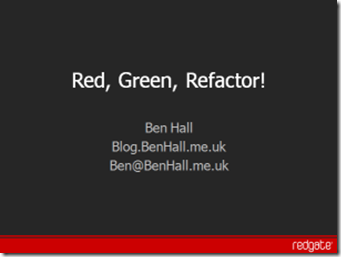 I will be doing my Red, Green, Refactor session! Starting to unit test your first project is difficult, where to start? What to test? How do you even get started? In this session, Ben starts from scratch and implements an ASP.net 2.0 application using test driven development techniques. The application will have to deal with real world situations such as databases, web services and even some users! Ben will demonstrate how to design the application for testability and how unit testing and mock frameworks can make your life easier and your tests less fragile. At the end, will the tests go green?